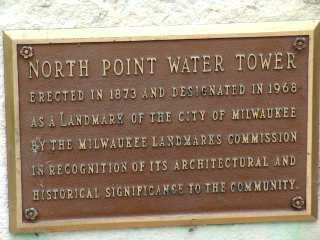 Milwaukee's Old North Point Water Tower. 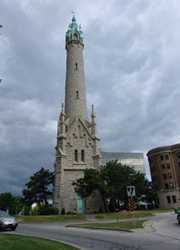 Built in 1873 and designated a landmark in 1968, the tower is actually an ornate Niagra Limestone shell built around a 120 foot high wrought iron standpipe. The complete height of the structure is 175 feet. The photos presented here were taken in June of 2005 by Ken Rudine who relates how he came to find it during a his trip photographing lighthouses. "Just before this picture we had found the North Point Lighthouse back in the trees. A local police car was parked there. We drove up and I got out and introduced ourselves to the officer behind the wheel. I told him about our lighthouse photo journey and asked if he knew of any more lighthouses nearby. He said he knew of one we wouldn't have any trouble finding. It was about 2 miles from where we stood and "it's in the middle of the road." 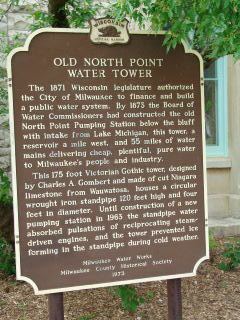 That is how we were introduced to the North Point water tower.